In case you've forgotten, recycling is the process by which waste items are collected and sorted, then processed into the raw materials that can later be manufactured into new products. Sometimes the waste being recycled is made into the same product over and over again, resulting in what is called closed loop recycling. 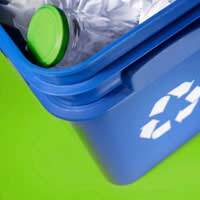 Waste may also be recycled into different products, a cycle known as open loop recycling. Regardless of what happens to the materials that are created from recycled waste, the important point is that what already exists is being reused and no new waste need be generated. If you don't live in an area where household recycling is collected, you'll need to do a little research to find the recycling bank nearest you. Contact your local council for full information on recycling services near you. Unfortunately here in the UK we lag far behind many of our European neighbours in our recycling habits. The good news is that the amount of household waste recycled every year in the UK has steadily risen and 2005 saw the highest recycling rates yet. If we all do our part to recycle what we can, the next few years will certainly continue this trend. In addition to recycling what you can, try to reduce the number of products and packing that you purchase, and reuse those that you already own. If you haven't started already, begin reducing, reusing and recycling your household waste and urge your family and friends to follow suit. Good luck!